I’ve particularly enjoyed jazz piano as far back as I can remember recognizing jazz. The piano is a big orchestra in a big box that a single human can conduct with ten fingers. Everyone’s fingers, ears and brain differ, and no two pianists playing even the same tune on the same piano will sound exactly alike. And in jazz, even the same pianist playing the same tune on the same piano will produce something at least a little bit different from one gig to the next. Unlike a symphony orchestra or a jazz big band, a piano is best enjoyed in much smaller spaces, in solo, duet, or small ensemble settings that most readily allow the pianist to lead, support, or interact. 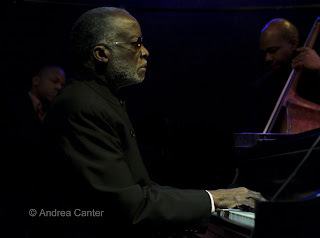 Small spaces allow the serious listener to become a silent witness to the creative process, and when one has the fortune to be seated within a few feet of the piano, when the pianist is Ahmad Jamal, the magic is as visual as it is aural. Twice I have observed piano magic from a few feet. Two years ago I sat in the first row of the (old) Jazz Showcase in Chicago for a very sparsely attended Sunday matinee of the Kenny Barron Trio with Buster Williams and Ben Riley. I could almost reach the keyboard myself. It didn’t matter to Barron if there were a dozen or a hundred in the audience, he came to play. He played for me. From my perch I could focus on every movement, every touch, every lingering note. Last night the Dakota Jazz Club was overflowing, the entire main floor and mezzanine filled for the opening set of Ahmad Jamal’s “new” quartet. (In addition to long-time bassist James Cammack, Jamal reunited with percussionist Manolo Badrena and had recently brought on James Johnson as his regular drummer.) Somehow I scored a table about six feet from the edge of the piano bench, the piano for this particular gig a Steinway in place of the club’s own Yamaha, placed in the center of the stage, the bench perfectly aligned with my table. While it lacked the house party privacy of that afternoon in Chicago, the situation nevertheless offered a rare intimacy, even for a jazz club. I have seen Ahmad Jamal at the Dakota (in Minneapolis and in the old location in St. Paul) at least four times now, and each time he seems younger, more agile, more peaceful, more engaging. At 78 he is one of the last survivors of the swing to bop to post-bop generation, a bridge between the older Hank Jones, Dave Brubeck and Marian McPartland, and the younger brigade of McCoy Tyner, Chick Corea, Herbie Hancock and Keith Jarrett. He inspired no less than Miles Davis as well as countless others who tried to follow. Tonight he inspired us all, musicians or not. Merely observing and hearing Jamal, especially from a few feet away, offers lessons in patience, efficiency, balance and collaboration. The concept of “patience” is not often mentioned in discussions of music. But perhaps it should be, and an evening with Ahmad Jamal is proof. Regardless of the speed of his fingers—and at 78, his speed and dexterity remain phenomenal, one never feels he is rushing to judgment. Each idea, each note is given its due. Yet full development is never prolonged—the idea resolved, the master moves on. The motion of musical ideas is nearly constant yet never wasted—if his intent can be fulfilled with just the right hand, the left can rest. And vice versa. Space here is not a vacuum—a pause allows that magical sonic dust to settle a bit before another whirlwind stirs the cauldron of creation. A final note might slowly dissipate in a wispy cloud or explode like that last blast of 4th of July fireworks. The fingers might stop, Jamal might even rise up from the bench and turn his attention to Badrena’s menagerie of percussion gear, physically proscribing the breathing room he gives his partners. The balance of space and dynamics has been a long-standing hallmark of Jamal’s compositions and improvisations. His notes seemingly tumble out of his fingertips, perfectly articulated, at gravity-defying speed only to suddenly halt, turn, and flutter into piles of sonic dust; percussive bursts and hand-over-hand arpeggios of densely voiced chords give way to delicate filigree phrases, all within a few bars. The loudest thunder might follow a barely audible breeze, yet the dynamic shifts never seem to disrupt the artistic flow. It is always surprising yet invariably coherent. I’m not aware of any other pianist who displays the ferocity of McCoy Tyner and the delicacy of Bill Evans in such tight juxtaposition. Last night, Jamal announced some of the compositions, many from his latest, majestic recording, aptly titled It’s Magic. For the most part, the titles were superfluous as the pianist reinvents each piece as a superstar quarterback issues audibles at the line of scrimmage, designing and directing his team with a nod of his head, a wave of his hand, a turn of his phrasing. Practically sitting on that line of scrimmage, we visually witnessed some of that communication, yet clearly there’s a telepathic connection as well. Certainly the success of the evening was in part due to Ahmad Jamal’s stellar partners—drummer James Johnson who displayed a sense of space and time wholly compatible with Jamal’s, never overpowering yet offering a full range of supporting (seldom soloing) camaraderie; 26-year partner and sympathetic bassist James Cammack, whose position a bit behind the piano belies the magnitude of his contribution and the graceful dance of his hands; and percussion master Manolo Badrena, who largely evoked Latin rhythm through subtle shadings that hinted rather than thundered clave. Jamal typically includes his reinterpretation of standards as well as original compositions in a given set, but at times the “standard” exists only in remnants of melody rewoven into new fabric, elaborated over an extended collaborative context like “The Way You Look Tonight” or in minimalist quilting like the closing one-minute rendering of “Like Someone In Love.” What the audience always anticipates is “Poinciana,” Jamal’s signature tune for the past 50 years. Ahmad didn’t write it, but he surely owns it. And as familiar as the underlying drum vamp has become, one never knows where Jamal will take the melody. Last night, the introduction with just left hand bass notes elongated to nearly three minutes before we all smiled in recognition. For as close as we were sitting, the sound was cleanly balanced; we could feel the vibrations of each instrument, see the expression of each musician, and experience their interaction as a private encounter with the spontaneity of creative genius. Moments of joy, shared. 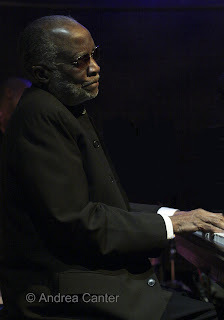 Ahmad Jamal and his quartet perform again tonight and tomorrow night, 7 and 9:30 pm at the Dakota. Photos taken during the opening set on November 24th by Andrea Canter... a few feet away.